Last weekend I visited the Virginia Museum of Fine Arts, where the exhibition “Kehinde Wiley: A New Republic” is showing through September 5, a fifteen-year survey of Wiley’s art organized by the Brooklyn Museum. An academically trained artist, Wiley paints black and brown bodies in proud poses against ornate decorative backgrounds on monumental canvases, riffing on art-historical masterpieces from the Renaissance and Baroque eras. He “street casts” his models: walks the streets of inner-city neighborhoods, inviting black males, ages eighteen to thirty-five, to sit for portraits. In this collaborative process, the model chooses a reproduction of a painting from a book and reenacts, in his streetwear, the pose of the painting’s figure. Cultural critic Touré describes Wiley’s oeuvre as an “attempt to rehabilitate black images”—in the media (especially before the presidency of Barack Obama), often simplistically skewed toward hip-hop music videos and newsreels of urban gang violence—“by putting them in the context of nobility, of import, of beauty” (52). Kings, nobles, and wealthy merchants are among the subjects depicted in Wiley’s source material. But biblical and extrabiblical saints, and Christ himself, are also present. For centuries religious imagery had a commanding presence in churches, palaces, homes, and government buildings, exercising sway over the imagination and steering popular devotion. By translating European devotional paintings—fashioned in the image of the white ruling class—into a contemporary idiom that places black bodies up front and center, Wiley rectifies the lack of representation of racial minorities in and as the body of Christ. 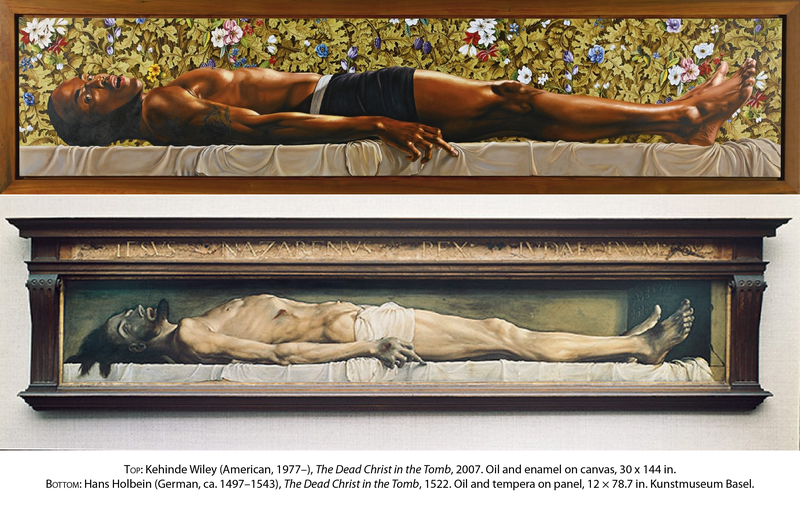 His Down series, which seeks to capture the majesty and severity of fallen warriors and entombed saints, features three paintings of the dead Christ. Hans Holbein’s life-size predella panel on the subject was the starting point; showing Jesus’s putrefying corpse, it is regarded as one of the all-time most grotesque paintings of Jesus. In The Idiot, Dostoyevsky’s Prince Mishkin says that viewed in isolation from the Resurrection, the painting has the power to make one lose one’s Christian faith. The Down series predates the Black Lives Matter movement but speaks powerfully into that context. It challenges the public—especially the white public—to see the rampant shooting deaths of unarmed black men by police and to name it what it is: an injustice, a tragedy. In these three paintings Wiley continues the legacy of those Harlem Renaissance artists—poets, illustrators, musicians—who linked the nation’s destruction of black bodies through lynching to the Crucifixion of Christ. Similarly, his Ecce Homo, after Anthony Van Dyck, speaks to the mass incarceration of black men, who, whether innocent or not, are made victims of the New Jim Crow, as Michelle Alexander calls it. Could it be that certain inbred fears or prejudices are responsible for the sometimes wrongful arrests and convictions of African Americans, who make up a disproportionate amount of the United States prison population? Gender is another element Wiley plays with: he sometimes has males pose as female saints and vice versa, leading critics to describe his work as postgender. For example, a man stands in for the prophetess Anna, who upon seeing the infant Christ presented by his parents in the temple “began to give thanks to God and to speak of him to all who were waiting for the redemption of Jerusalem” (Luke 2:38). Giotto’s Presentation in the Temple—the 1305 fresco from the Scrovegni Chapel and the later, very similar panel painting—provided models for Wiley’s composition. As with almost all his works, Wiley has removed the figure from her/his narrative and spatial context, setting a naturalistic “Anna” against a decorative backdrop. Golden tendrils swirl about like incense, passing over the figure’s Broncos jersey and jeans. His raised hand gestures toward (the out-of-frame) God incarnate—beholds and shares this blessing. In a photograph series called Black Light, male models pose as the Annunciatory Angel, the Virgin Mary, Mary Magdelene, and Saint Francis, inspired by Old Masters from Italy, Spain, and France. I especially like Wiley’s Saint Francis, dressed in long-sleeved plaid, black denim, and a sideways ball cap. Here he is during a forty-day fast, receiving an angelic vision that unites him to the pain and suffering of Christ—and that imparts to him the five stigmata that he bears throughout the rest of his life. A chain-link fence, flower wrapped, pierces through his right hand and seeks entry into his side. One of my favorite Wileys on display at the VMFA is Leviathan Zodiac, part of his World Stage: Israel series. Kehinde Wiley (American, 1977–), Leviathan Zodiac, 2011. Oil and gold enamel on canvas, 95.75 × 71.75 in. Figurative painting has few precedents in Jewish art, so Wiley looked to intricately patterned papercuts—a form of Jewish folk and ceremonial art—for inspiration. His Leviathan Zodiac is based on a nineteenth-century papercut from eastern Europe whose central design is a highly stylized menorah encircled by Leviathan (a sea monster referenced in the Bible) and surrounded by signs of the galgal ha-mazzalot (zodiac). The fish shaped as a circle, its tail in its mouth, is the most common representation of Leviathan in Jewish folk art of the past two or three centuries. The zodiac is also a fairly common motif, having been first mentioned in the medieval kabbalistic Sefer Yetzirah (Book of Formation) and in the late fifteenth-century Midrashic anthology Yalqut Shim‘oni. Jewish papercut, probably late 19th century, perhaps from Bohemia or Slovakia, 12.3 × 16 in. All this forms the backdrop to Wiley’s portrait of an Israeli Jew, who’s haloed by the outer ring of the design. Birds flutter about his head, and another winged creature blows a shofar. Lions, Decalogue, and Hands of a Kohen from Anshe Emeth Synagogue on Coney Island, ca. 1920, by Marcus Charles Illions (American, 1865/74– 1949). Paint and gold leaf on wood with glass eyes, 32.8 × 71.4 × 9 in. Sea Breeze Jewish Center, Brooklyn, New York. Though Wiley is most recognized for his large-scale canvas paintings, he has also done smaller paintings on wood and has designed stained glass. Inspired by Byzantine iconography, his Iconic series consists of intimate altarpiece portraits of Elijah, John the Baptist, Saints Paul and Gregory Palamas, Archangels Gabriel and Michael, and Jesus as king and high priest. Kehinde Wiley (American, 1977–), Saint Gregory Palamas, 2014. Gold leaf and oil on wood panel, 40 × 24 × 2 in. A monk of Mount Athos in Greece and later the Archbishop of Thessalonica, Gregory Palamas was a preeminent theologian of the mystical prayer tradition known as hesychasm. Because of his numerous writings, he is traditionally shown holding a book or a scroll. Here he holds the book Icons and Saints of the Eastern Orthodox Church from the Getty Museum’s Guide to Imagery series, while his other hand approximates the Greek letters IC XC (for “Jesus Christ”). As throughout the series, Wiley has inscribed the name of the sitter, rather than the canonized saint of the painting’s title, on the gilt frame. In 2014 Wiley executed a series of stained glass portrait designs, which were actualized by artisan manufacturers in the Czech Republic. They’re all based on windows by nineteenth-century French artist Jean Auguste Dominique Ingres. In Ingres’s stained glass design (and Wiley’s redesign), Saint Adelaide holds in her left hand a scepter and globe (symbols of empire) and a book (she assisted her husband with her knowledge of Latin, which he never learned). With her right hand she dispenses a gold coin to the poor (she was known for her charity). Saint Amelia (or Amalberga) is an eighth-century noblewoman from Belgium who was devoted to a life of chastity. Her beauty, though, attracted the attention of Charlemagne; when she resisted his advances, he unintentionally broke her arm, but it miraculously healed. Saint Remi (or Remigius), bishop of Reims, converted Clovis I, king of the Franks, to Christianity in 496. Clovis’s baptism led to the conversion of the entire Frankish people. In this portrait he is shown raising an empty vial, a reference to a miracle he performed: when a dying pagan asked him for baptism, there were no sacramental oils available, so he prayed before two empty vials, and they filled with oil from heaven. The dove signifies God’s presiding over baptisms. Saint Ursula was a Romano-British princess who, along with her eleven thousand handmaids, was killed by Huns while on pilgrimage. The use of women as portrait subjects is a newer addition to Wiley’s body of work. His World Stage: Jamaica series features two biblical hero(in)es: Ruth and John the Baptist. These are only some of the many religious figures Wiley has painted over his fifteen-year career thus far. Others include Judith, Saint George, Saint Benedict, Saint Clement, Saint Anthony of Padua, and The Virgin Martyr Saint Cecilia (after Stefano Maderno). Whereas “whiteness” and “holy” have long been conflated in Western art, Wiley proclaims holy blackness. His racialization of beloved Christian saints prompts us to recognize the dignity and sacredness of people of color, the imago Dei in which we all are made. To me the interchangeability of the sexes was a bit of a barrier to connecting with the pieces in a devotional way, but I don’t think Wiley intended that use. (Still, I think portions of “A New Republic” would make an excellent church exhibition!) Playful and political, exultant and subversive, Wiley’s work provides us with new pictures of heroism to supplement those bequeathed to us by the European Old Masters. Kehinde Wiley (American, 1977–), Go (ceiling painting), 2003. Oil on five panels, 10 × 20 ft.
To view more art by Kehinde Wiley (or the above in higher resolution), visit http://kehindewiley.com. Well, the commentary here refers to ‘black brothers and sisters”, and, while I find Wiley’s images moving, I do not see too many sisters in them. I guess we all have our shortcomings, not least when informed by a patriarchal religion like Christianity. Thank you so much for sharing the experience of seeing this show with us. It’s hard to imagine a better example of why contemporary art criticism sometimes needs to be theologically informed. I would have loved to see these works in person. Were the windows back lit? They are stunning. And it’s so good to see him begin to welcome women into the fold. Yes, the windows were backlit, and set in their own darkened room. Not all the works in this post were on display at the VMFA–I think that as the exhibition travels, space dictates how many can be shown–but there was a great variety of about 60. Wiley is definitely known for his male portraits, but yeah, I’m glad too that he’s been trying his hand at female ones more recently. His Economy of Grace series (2012) is entirely devoted to them–women in custom-designed Givenchy gowns.